Utica, NY, USA – A new sanitary, high-intensity continuous blender, Model HIM-124-S316, from Munson Machinery provides low to high shear as required for high speed blending and/or homogenising of dry solids, agglomerates, slurries or pastes when processing food, chemicals, pharmaceuticals or other contamination-sensitive materials. Homogeneous blends can be achieved in as little as 20 seconds residence time depending on material characteristics, at throughput rates to 5.7 m3/h. 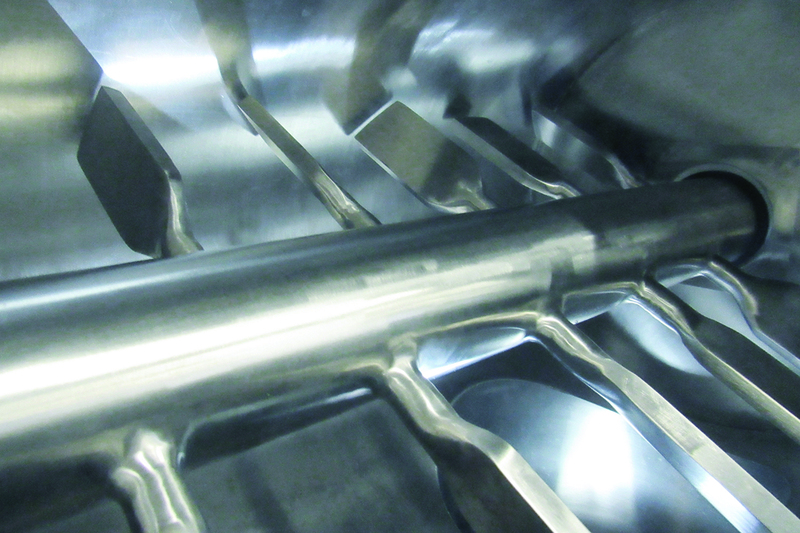 Liquids can also be added in small to large amounts through optional injection ports for de-dusting and agglomerating of dry materials, as well as for producing pastes, emulsions and slurries. 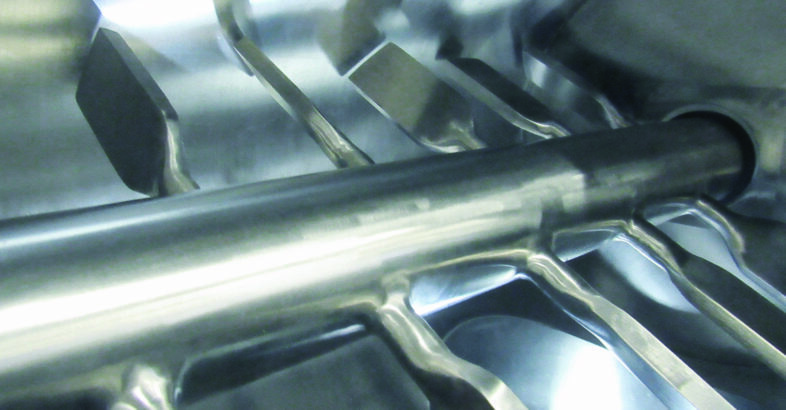 The unit’s horizontal, cylindrical vessel with a single high-speed rotating agitator is supported by externally-mounted bearings with sanitary type seals. This sanitary, high-intensity continuous blender, Model HIM-124-S316 from Munson Machinery, provides low to high shear needed for high speed blending and/or homogenising of dry solids, agglomerates, slurries or pastes when processing food, chemicals, pharmaceuticals or other materials where contamination is a concern. Large radius welds joining the large-diameter, solid shaft to blending paddle stand-offs allow rapid cleaning and sanitising. For wash down, water or cleaning solution can be introduced through the injection ports and retained by an optional gate at the outlet of the discharge chute before running the machine to dislodge any solids adhering to interior surfaces. A flanged outlet on the side of discharge chute allows draining of the liquid. Constructed of #316 stainless steel and finished to USDA, FDA or pharmaceutical requirements, the blender is available with an insulated low-pressure jacket, or high-pressure jacket constructed to ASME code that can be heated or cooled, as processes dictate. The blender and motor are mounted on a common support base. The standard blender drive is a multiple “V” belt and sheave arrangement. Agitator speeds range from 100 to 2500 RPM depending on the application. Optional gear drives are available for reduced speed, high-torque requirements. All drives are furnished with totally enclosed guards. For non-sanitary applications, threaded 180° adjustable paddles for varying degrees of blending intensity are offered as standard. Solid shaft with large-radius welded paddles allows rapid cleaning and sanitising. Also available are threaded 180° adjustable paddles for varying degrees of blending intensity. Other high-intensity blenders can be fabricated of carbon steel, #304 stainless steel, abrasion-resistant steel or exotic alloys, and the paddle faces can be hard-faced for extreme wear conditions. 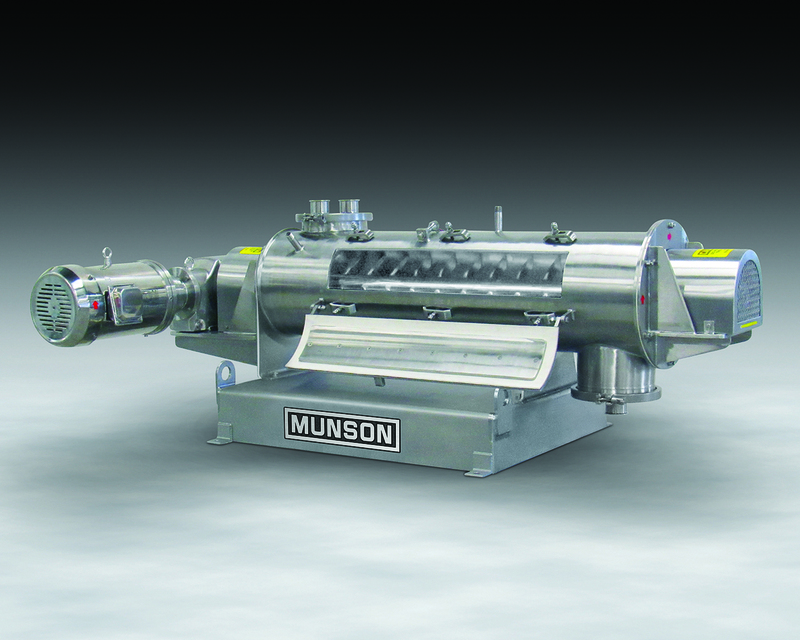 Other mixing and blending machinery offered by Munson includes Rotary Batch Mixers, Ribbon/Paddle/Plow Blenders, Vee-Cone Blenders, Fluidised Bed Mixers, and Rotary Continuous Mixers. Size reduction equipment includes Screen Classifying Cutters, Pin Mills, Attrition Mills, Lump Breakers, Rotary Knife Cutters, Hammer Mills, Crushers and Shredders.